It’s totally natural that neither Leko nor Kramnik could play seriously against each other. And why put on a performance. What’s the point in such a comedy? I don’t want to pour salt on your wounds, of course, but Vladimir Kramnik, you must admit, wouldn’t have lost to Peter Leko. I understand they worked together before the match against Anand in Bonn and, no doubt, it wouldn’t have been very comfortable for Vladimir to play Leko, but the interests of the team come first, don’t they? You’re right. If Volodya had taken part in the match then it’s very likely that it would have been unpleasant for him to play Leko, but Kramnik is Kramnik. 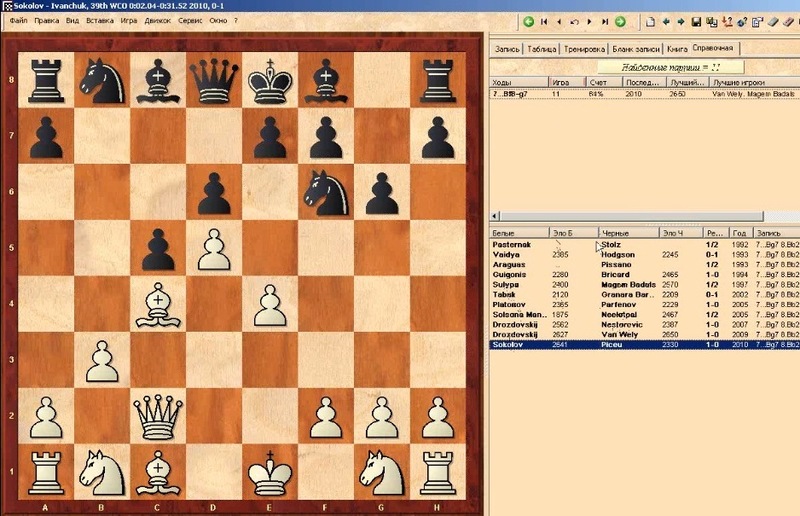 He wouldn’t have lost the opening to the Hungarian grandmaster… There was also the option of switching the boards around which, as it turned out, deserved a closer look. I must admit: today was a day when the trainer’s first mistake at the Olympiad resulted in failure. The Hungarians constructed their tactics very competently. They even decided to give up one of their games with the white pieces, so that on the one board remaining they could try, if not to win, then at least to draw 2:2 with us. Let’s be honest: we’ve had no “penetration” in this tournament either from Malakhov or Svidler. Malakhov, for example, at some point had an extra pawn and it seemed as though he had some practical chances of winning. But firstly, his opponent defended tenaciously, and secondly, the position was nevertheless closer to a draw. Though Vladimir did give up a couple of tempos in a technical position: he could have played more energetically… Well, and Peter Svidler got nothing at all. You know, even in the good old days the Hungarians were always inconvenient opponents for us. 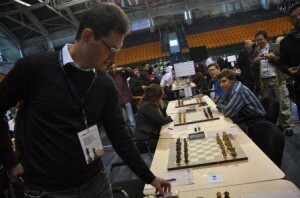 The renowned Hungarian School produces very strong grandmasters. No-one’s insured against defeats. You have to assume that even the luckiest teams will drop points in the rounds to come. But for us now even draws are outlawed. Can Russia-1 keep up that pace? It’s only the fifth round. As the tennis player Federer says in such situations, it hurts to lose a final. It would hurt to lose in the final round, but for now nothing’s yet lost. Olympiads are almost always decided in the final three matches, so we’re not going to let it affect us. We’ll work on our mistakes, draw conclusions and approach each match as if it’s the most important one. For me it’s totally clear that six wins should give us overall victory. We believe we can do it! What do you think, do our star line-ups still have chances of victory? One lost match doesn’t decide anything. Even a World Team couldn’t get through such a difficult tournament without shocks. Everything’s still to come both for the first and second Russian teams. And for the third as well, by the way. And here an incredible situation – the move b3, which actually loses a pawn, has been made more than once, and by strong chess players, including Yury Drozdovskij – i.e. very good players, even Luke Van Wely, if I remember correctly. Yes, and Sulypa, an excellent master, Sokolov himself, of course, Drozdovskij… and everyone replied 7…Bg7. It’s simply incredible i.e. no-one took the pawn on e4. Everyone played 7…Bg7 and allowed white to play Bb2 – some sort of universal blackout. But Vasily isn’t the kind of person you can hypnotise – he’d clearly looked in the computer before the game at how Sokolov plays, and noticed Sokolov’s game against… I don’t know how to pronounce the surname… [Piceu] but in any case he noticed that Sokolov simply blundered a pawn, so he just took on e4. If 8. 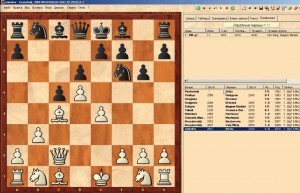 Qxe4 then 8…Bg7 follows and white’s down an exchange. It’s incredible. I think that Sokolov must have been shocked here – after all he’d already played the position, so how could something like that happen!? Why didn’t you play Kramnik in the important match with Hungary? With Svidler I blundered completely because he failed to make a game of it, he couldn’t carry out the task that was put in front of the “white players” in that round. No doubt you realised that Almasi would play the Berlin? 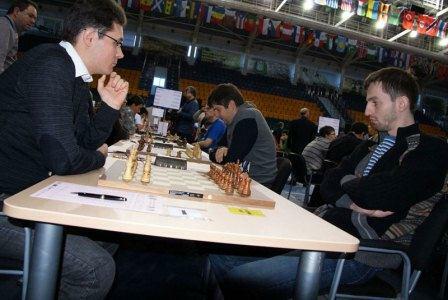 Of course, if Kramnik had played the same position against Leko then he wouldn’t have lost it. He knows that line better, no doubt, because it’s the Catalan. On the other hand, it could all have gone differently: Leko might have made the move 1. e2-e4 as it’s unlikely he’d have played the Catalan against Kramnik. It would have been a different life, a different story. So that I had some sort of basis for taking the decision; it’s another matter that it didn’t work and turned out to be a mistake. But there were ideas. 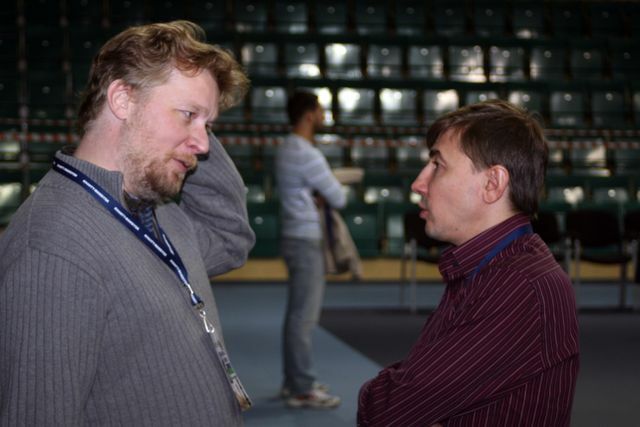 There were misfires for Svidler and Timofeev (in the second team) in the Berlin endgame. 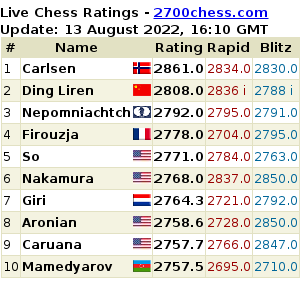 You and Kramnik, no doubt, are the top specialists in that variation. Did you give pure chess help to Peter and Artem? Of course in my team there are two people in a more or less normal situation, while the remaining three have to draw certain conclusions for themselves. The way the first team’s playing now we won’t win anything. But, without doubt, we can get better. Even with less than optimal play and it looking impossible we nevertheless managed to win the first four matches. But then when we met a more serious opponent all our weaknesses came out into the open. Now we’ll have such opponents, if not every day, then every other day. If our weaknesses remain so glaringly obvious then what can we hope for? We have to find resources to improve – both in play and in some non-chess factors. A professional’s professional in so far as he can change the course of his “meteor” [lit. bolide] and improve his play. During the preparation period we did everything in order to have enough energy for the full distance. Nothing terrible has happened and it’s important to improve on what is essentially, even without that, reasonable play. But we do need to improve some things.